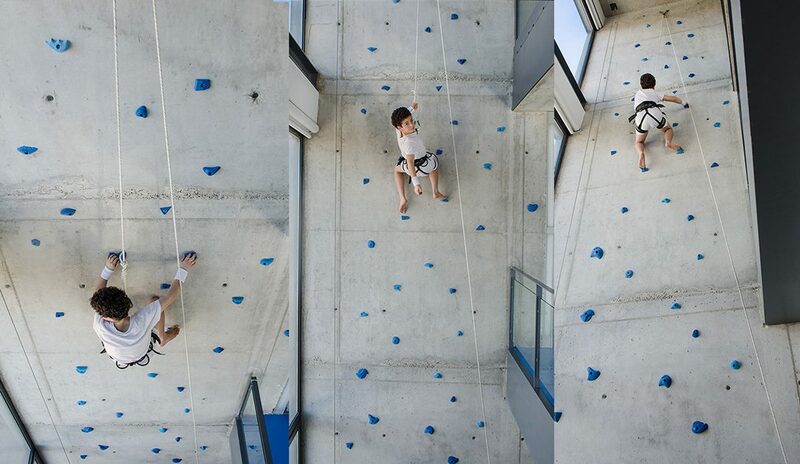 Spanish studio playoffice has inserted a playful gym, complete with a climbing area into a family home. Realizing the dream of most children to have a playground actually inside their living room, a blue wall occupies an expansive three floor void that they can climb all the way to the top of. wanting to avoid the traditional idea of a work out space, the colorful interior incorporates just a few key elements – a circuit of exercises tests the coordination, strength and balance of the whole family. the concrete texture and use of blue also add to the sense of fun, helping to achieve a relaxing atmosphere that is conducive to the growth and development of healthy kids.